Francois Francoeur was a French violinist and composer born on September 8, 1698 (J.S. Bach was thirteen years old.) He was first taught violin by his father, an orchestral bass player (and member of the King’s 24 Violins – 24 Violons du Roy), then entered the Royal Academy of Music (Paris) at the age of 15. After appearances in the major European cities, he returned to Paris and eventually joined the King’s 24 Violins also (1730.) 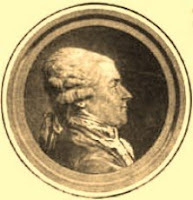 In 1739, he was appointed music instructor at the Opera and Opera Inspector in 1744. He moved up to Manager of the Opera in 1753 and then became Music Master to the King (1760.) Along the way, he composed 10 operas, a few ballets, two books of violin sonatas, and other small works – music which is quite forgotten and almost never performed nowadays. It has been said that his compositional style fell somewhere between Baroque and Classical. Francoeur died on August 5, 1787, at age 88 – four years later, Mozart would be dead, too.